The financial ecosystem around YouTube stars has expanded with the arrival of Peg.co, an online matchmaker for vloggers and brands. As more brands put budget behind vlogger campaigns (EE, Direct Line and Mondelez, to name a few) to reach a younger generation of consumers, Peg.co’s aim is to demystify the process by suggesting the best vloggers for a particular brand. The service functions as a search engine, with the phrase: "I want to find the best YouTube creators in... who make videos about... ". Changing the variables to ‘UK’ and ‘Gaming’ brings up vloggers such as Dan and Phil, for example, but not PewDiePie because he’s Swedish. Searchers can look for vloggers across a wide range of global markets and across 11 topics in total, including fashion, science and technology, music and comedy. Perhaps most appealingly for brands, Peg.co also provides deeper stats beyond the basic subscriber metrics given out by YouTube. Peg’s scoring system pulls together average views per video, which lets brands see whether a YouTuber is a one-off viral hit or has built a consistent audience. 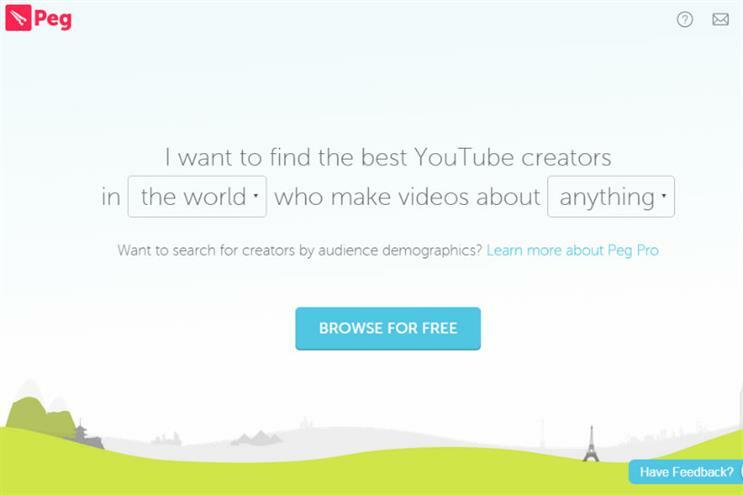 Interestingly, Peg also searches by channel keywords and audience demographics to show the most suitable YouTubers - information that isn’t readily available to brands. Since channel demographics are usually private, Peg.co will have to work with YouTubers and the talent networks that manage them, known as multi-channel networks (MCNs), to verify its information. As yet, Peg.co hasn’t officially signed any MCNs up, and is instead using its own algorithms to predict a particular YouTuber’s channel demographics. Founder Nic Yeeles said Peg.co was focusing on signing up brands and agencies to the service, before approaching YouTubers and MCNs to verify their information. "We are already in talks with a lot of the biggest MCNs globally, who have agreed to sign up their talent on Peg," he told Marketing. With the absence of verification, brands will have to rely on Peg’s predictive scoring, which Yeeles claims is "99% accurate". As it stands, there is no public information on YouTube channel demographics available to brands, so predicted data may be better than nothing. Another interesting data point provided by Peg.co is whether a YouTuber has worked with other brands, meaning marketers and agencies can check whether a vlogger has promoted a rival product. Basic search on Peg.co is free, but searching by demographic and prior brand collaborations will cost a fee. Peg Campaign costs £200 for a fortnight’s access for up to two users, while Peg Pro gives an annual licence for £1,200 for up to five users. Finally, there’s Peg Enterprise, a bespoke option offered to larger agencies. Yeeles, formerly digital brand director at Sony Music’s Syco Entertainment, believes services like Peg.co will make YouTube less of a 'wild west' for brands. He also believes media spend will increasingly move away from traditional TV advertising to platforms like YouTube. He told Marketing: "It will be similar to social media. When that first came about, there was all this interest and hype, and hesitation and scepticism over measurement, ROI and whether it was a gimmick. Fast-forward to now, and social media is an absolute no-brainer, every brand and agency has to be able to use it." Yeeles recalls working at Syco with YouTubers who would charge a few thousand pounds for a couple of videos. Now, he says, lesser YouTube stars can command fees of up to £100,000 for a single video. He also points to developments like GroupM setting up The&Collective, an influencer marketing platform that connects brands with young digital talent. For Yeeles, YouTube offers brands a depth of content that TV never can. He likens TV to Orwell’s Nineteen Eighty-Four. "That’s what the TV industry has become. It’s channel commissioners who decide what we watch. But when YouTube came along, it democratised the making of content – anyone of any background can make content. That’s something I found very exciting. "I want to support that and try and shift these huge global ad budgets towards these creatives."